The most complete AIBO game set in existence! Play Reversi, Memory, Tictaibo and AiboDice with AIBO! 1 CD-ROM containing the Aibotoys Gamepack One software: play AiboReversi, AiboMemory, Tictaibo and AiboDice! 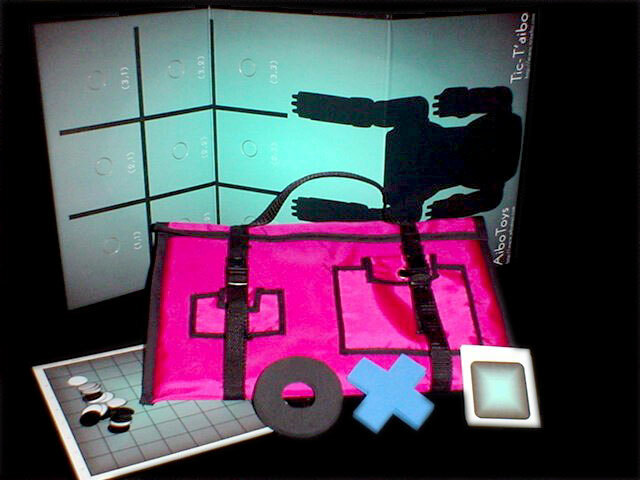 1 Carrying bag with practical pockets to hold the complete game set accessories. Very pretty ! Please note: You have to install this game on your own memory stick from the CD-ROM. This game is available on a Sony AIBO Programming Memory Stick at additional cost; please inquire with us. A complete Instant Messenger application made especially for your AIBO! Connect to an XMPP/Jabber Instant Messenger server, chat with your buddies... AIBO will react to the conversation! You can also use freely available tools to design new AIBO emoticons that are installable on Messenbo. Share your creations with your friends! Everybody can use free tools to create new emoticon for AIBO, install on Messenbo. Share your creations with your friends! Please note: You have to install this game on your own memory stick from the Messenbo menus. In some cases we can provide a Sony AIBO Programming Memory Stick at additional cost; please inquire with us.